Families of journalists say they "continue to appeal for their release"
WASHINGTON (CNN) -- The Swedish ambassador met with two imprisoned U.S. journalists in Pyongyang on Tuesday, a U.S. State Department spokesman said, in their first meeting since a North Korean court handed the reporters their 12-year sentence. The spokesman said he could not provide details of the conversation between the Swedish ambassador and Current TV journalists Euna Lee and Laura Ling. The journalists were apprehended in March near North Korea's border with China and accused of illegally crossing the border and plotting a smear campaign against North Korea. After a closed trial, Lee and Ling were sentenced to 12 years in prison earlier this month. Also on Tuesday, a statement obtained by CNN from the families of Ling and Lee expressed gratitude that North Korean officials permitted the Swedish ambassador's visit. "The families of Laura Ling and Euna Lee are grateful to the North Korean government for allowing the Swedish ambassador to visit Laura and Euna. We continue to appeal for their release on humanitarian grounds," the statement read. The Swedish ambassador met with the journalists in March and May. He last visited them June 1, said State Department spokesman Ian Kelly. The ambassador has requested more access to the journalists, but has not received it. "Well, I know that he's in constant contact with the North Korean foreign ministry, is constantly pressing them for more information about these two young women," Kelly said. The Swedish ambassador represents U.S. interests in the country because the United States does not have diplomatic relations with North Korea. The United States, though, is "pursuing many different avenues" to free the journalists, Kelly said. He declined to elaborate. Secretary of State Hillary Clinton has called on North Korea to release the journalists on humanitarian grounds. 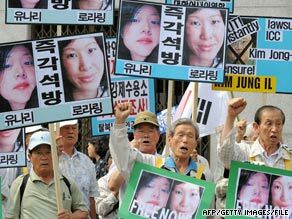 Families of the women said they were shocked and devastated after the trial and subsequent sentences of Ling and Lee. Family members have said Ling suffers from an unspecified serious medical condition and that Lee has a 4-year-old daughter "who is displaying signs of anguish over the absence of her mother."